Welcome to Sydney. Welcome to Australia. 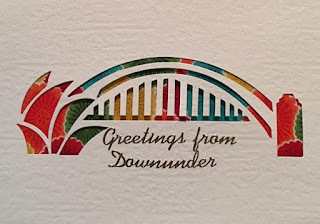 Small works of art to send to your friends to remind them to come and visit Australia or just to say hi from Sydney. 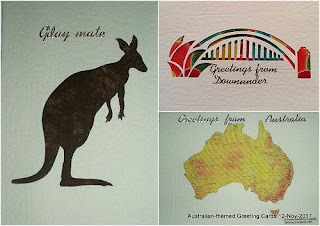 These are fabric picture cards that displays Australia's number one icon the Sydney Opera House, kangaroo and a map of the land downunder. Unique fabric prints are fitted inside the window cutouts to highlight the image of the card. Wadding of excellent quality are used to produce a raised effect of the image being displayed by the cards' window cutouts. Fabrics used are 100% cotton. And each card comes with a matching whie envelope for easy mailing and/or gift-giving. Check them out by a click on any of the images above or click on the link below. A great way to say hello to your special friends overseas.